The cloth pinched tight over my eyes. Someone held my hand. Too small to be my mother’s hand, but she was my guardian so she must have been there somewhere too. The ground uneven beneath my feet as we walked; lifting in subtle rises and falling dips. The grass brushed against my arms, teasing and tickling. I resisted the urge to ask how much further. I was ten now and began the journey of my name trial. I would do whatever task the Chapa had appointed. My stomach fluttered at the thought of being away from my family. When they took Lightning away for his name trial, he hadn’t come back for a week. My eldest brother had been left all alone on the plains with the lions, foxes and worst of all the other tribes. When he had returned, he found out that our father, White Eagle, had died. My heart pounded against my chest and echoed in my ears. That wouldn’t happen to me, no one would die while I was gone. The warm hand let go of mine. I didn’t hear them leave – we Eagles are always silent – but I felt their presence dissipate as they retreated. I took a deep breath and slowly lifted my hands to the blindfold. The Chapa wouldn’t make me do anything life threatening. I was my mother’s only daughter. I had two older brothers, but only the eldest had a name. I pulled the blindfold down over my nose and mouth until it rested on my neck. I was surrounded by gold-copper grass. Not as tall here as it was near our camp. Here it only came up to my elbows while back home it would have been eye level. The morning sun beat down around me making everything seem a bit shinier. The God’s Ring curved high in the cloudless sky, a rainbow of pinks and purples. A cicada buzzed nearby. Yellow and black wings flashed as a speeder flew into the sky. I still wasn’t sure what my name trial was supposed to be. Usually the Chapa gave some guidance. 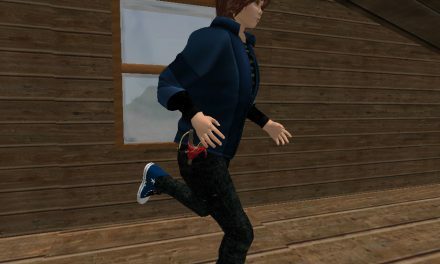 My brother had to retrieve a Red Plateau flower. My friend, Moonglow, had to travel by night to the Star Lit River. I took a step forward. I wasn’t sure where I was. Away from camp the plains looked the same. Open land, all grass. The sun wasn’t much help either, as I had no reference point to whether I was south or north of camp. I took another step forward, but—there. A flash of silver that held me frozen. A silver fox? Gone. I couldn’t be sure of what I had seen. They weren’t as large as lions, but they still dangerous, especially to a ten year old girl. I inched my hand back over my shoulder as silently as I could. I took my bow and notched an arrow. The grass did not stir as I waited. The fox was either gone or patiently watching me, just waiting for the opportune moment. Tiny bumps formed on my arms as the skin prickled. The back of my neck grew cold. Should I stay where I was or venture on? “I don’t want to hurt you, cousin fox,” I whispered. I also didn’t want him to hurt me. “I just want to earn a name.” I took a step to the side, my head twisting, searching for anything silver among the gold and copper. The chief’s eldest son had killed a fox on his name trial; that was how he got his name, Silver Fox. He still wore the fox fur on his shoulder. That fox had put up quite a fight according to the chief’s son. Would it be the same with this fox? Could I win if it attacked? My stomach opened at the thought, letting all the butterflies flitter about against my insides. I would be all right. The gods would watch out for me and the eagle would guide me. I looked up into the wide blue sky. There was no sign of an eagle. A low, quiet growl came from my right. The back of my neck tingled. I turned slowly towards the sound, stood on the tip of my toes and hunched up my shoulders in an attempt to look menacing. Silver Fox had been twelve not ten at his name trial. The boys always had theirs two years after the girls. But already at twelve he had been better with the bow and arrow than anyone else, including Lightning. I waited in the tall grass waiting for another sound. The cicada buzzed, but other than that there was nothing. 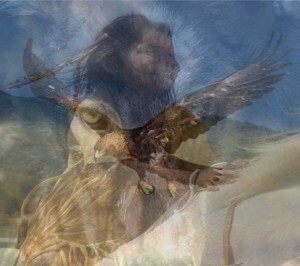 I became acutely aware of the wood of the bow in my hand, of the brown-gold eagle feather on the arrow. I took a slow, small step to the side, stopped and waited. One deep breathe to fill my lungs, then a second one. All was silence. I took another side step and another. I didn’t want to turn my back to the fox, nor did I want it to look like I was retreating from it. I hoped it had already left on its own and was far away from me. I kept walking to the side until I believed enough time had passed. The beating of my heart slowed as I became confident the fox was gone. I chose to continue on in the direction I was heading. The sun was well past its zenith by the time I got hungry. I hadn’t been allowed to bring any food with me, so if I wanted to eat, I needed to hunt. I hadn’t seen anything edible all day except for the speeder, but that was long gone. I crouched low to the ground and parted the grass searching for holes or nests. I didn’t find anything until the sun was nearly down. By that point, I was about ready to give up and look for a place to sleep instead. A small hole beneath a mound of dirt caught my attention. My stomach rumbled. I threw an arm over it, trying to cover the sound. I didn’t want to notify whatever was in the hole of my presence – if there even was something in the hole. It was too big to be a snake’s home. More likely it belonged to a rabbit or a gopher. I hoped it was a rabbit. They were tasty. I took a few steps down wind and waited. The horizon went from light blue to orange red. The sky directly over head grew darker as the shadow of night came on. Stars slowly began to wink into existence. The God’s Ring turned from purple pink to a line of pinkish white. The orange red on the horizon turned into a purple and finally darkened. A breeze picked up and blew through the grass. It wasn’t strong, just enough to blow a chill onto my cheeks. Father Moon’s silver light soon shown down over the gold-copper grass. I looked up hopefully when I heard the hoot of an owl, but I didn’t see it. Crickets began their symphony around me, almost as if encasing me in a safe barrier of sound. Logically I knew that would not keep away foxes and lions. My eyes grew heavy and began to sting. I was out in the open waiting for the rabbit. It was too dangerous to sleep. Perhaps I should have forgotten about food and looked for some sort of shelter. Shelter was not easy to find on the open plains. My nameless brother’s face came to mind. Another year and he would be twelve. He would have his name trial. I wished he was with me. We could talk about our friends or tell stories about the eagle. He could catch the rabbit for me in no time. I yawned, my jaws stretching wide, the corners of my mouth taut as the air filled my lungs and then released. My eyes dropped, my limbs dragged heavy, not wanting to move. Maybe I could just lie down and rest my body. I shook my head and sat up straighter. I couldn’t rest because then I would fall asleep. It was too dangerous to do that here. I focused on the rabbit hole as the orange light from Mother Moon crept over the horizon. Father Moon was high in the sky now. His silver tendrils of light fell all around me. Another yawn came on. It felt safe. The air was pleasantly warm. There were no signs of foxes or lions around. My eyes remained closed after I blinked. The darkness was welcoming. It was wrong to sleep. I needed to open my eyes. It was red beneath my eyelids which confused me because it was night. There shouldn’t have been enough light for that effect. I opened my eyes to the dawn, the sunlight stretched in wide beams across the plains. My chest grinded with disappointment. I had fallen asleep. Sure it had ended up all right, but anything could have stalked up on me during the night and I would have been oblivious. Something moved in front of me. I managed not to be startled and remained still. It was smaller than I had imagined, but that was all right. I was small too. The sunlight shimmered across the light brown fur parallel to the shadows of the grass. My hand snapped out for the bunny’s neck. It noticed too late. I killed it quickly ignoring the small amount of guilt that crept up. I needed to eat. It didn’t take long to skin and clean it. Soon I had it cooking over a small fire. My stomach grumbled as the delicious smell touched my nose. While it was cooking, I collected the dew from the tall grass. It was a meager amount of water, but it would suffice. I brought my wooden flute out and fingered the holes. I wondered again where exactly I was. How far away was home? What was my nameless brother doing? Normally we would all be sitting around the fire pit enjoying breakfast. He might pinch my arm and then Lightning would pinch his. Mother would scold all of us even though I hadn’t done anything except call my brother a boy. He was a little sensitive about that. He didn’t like the fact that I would receive a name first. I brought the flute to my lips and played my nameless brother’s favorite song. I missed him. He had helped me make my bow and arrows even though he knew he wouldn’t receive his own bow and arrows for another year. The next song I played I had composed when I was eight. It was called ‘Annoying Brothers’. I smiled when I reached the climax, a rapid combination of discordant notes. I composed it right after my brothers teased me for watching the warriors practice. I just liked watching their movements, their spears crashing together like eagle beaks. My father had finally told them to stop. That was how my song ended, with the heroism of my father. Tears sprang to my eyes as I thought of White Eagle. He was different from the rest of the tribe. He was a western man, light hair and skin. I took after my mother, black hair, dark skin, but I did inherit White Eagle’s green eyes. I was sure the other girls were jealous of me because of it. I smiled through my tears. I put my flute away and brushed the tears from my cheeks. I ate some of the rabbit, but saved most of it. I stood up and looked all around. The only thing I could see was the gold-copper grass. I supposed one way was as good as another. The day turned out to be hot. No clouds shadowed the sun. Its rays beat hard on top of my head. Moisture broke out on my forehead and on the back of my neck. My shirt clung unpleasantly to my back. The sun drifted low, when I decided I should find some sort of shelter. I couldn’t sleep in the open grass again, but finding shelter on the plains would to be difficult. I stepped out of the grass and blinked. In front of me, a wide clearing filled with boulders and rocks. At least I knew where I was. It was Sacred Eagle Rock. I had been traveling in the opposite direction of home. If this was Sacred Eagle Rock, I should have seen or heard eagles, but I hadn’t. It was starkly empty. What had happened to the eagles? If that great predator had disappeared, what did it mean for my tribe? I saw a silver flash among the rocks before it disappeared behind a boulder. A hot burning began in my chest and spread down through my stomach and legs, up through my shoulders and arms. What was a fox doing in this sacred place? I took my bow off my back and readied an arrow. I stepped silently through the rocks to get a better angle on the fox. I saw him just as his head shot up and his silver ears pricked. I stopped and waited. His head cocked to the side and then he slowly turned towards me. Horror washed through me and my stomach flipped. For a moment, I thought I would lose my breakfast. In the fox’s mouth was a young eagle. Blood decorated her feathers. She wasn’t moving. “What have you done, cousin fox?” I whispered. It turned and ran towards the grass with the eagle in its mouth. I screamed the war cry of the eagle, high and piercing. I let loose the arrow. It flew across the distance as glorious as an eagle dive. The arrow embedded deep in the fox’s hind quarters. It let out a whimper and stumbled among the rocks, then quickly recovered and ran on. I jumped after it, leaping from rock to rock as I readied another arrow. The arrow flew loose, striking the dirt inches away from the fox’s head. The fox dropped the eagle and changed directions. I readied another arrow, but the fox disappeared into the grass. I replaced my bow and walked to the eagle. Had the fox killed all the eagles? Was that what happened? Moisture sprung to my eyes. It couldn’t be the end of the great eagle. I stared down at the unmoving bird as a hard tear ripped deep in my chest. What was the point of me even having a name trial if there were no more eagles? What was the point of the Eagle tribe? I bent down and touched the brown and gold feathers. They were soft, softer than I had imagined. The eagle shuddered underneath my touch and gave a weak chirp. She was still alive. “Thank the gods.” I picked the eagle up and cradled her against my cheek. Her soft feathers tickled my skin. I had never felt anything so wonderful. I wrapped her in a cloth and took out my canteen. There wasn’t much water in it and I used up all of it to wash the blood from the eagle’s feathers. She squawked at me, but held still while she let me tend to her. I parted her feathers and put a small amount of ointment on the rips of her skin. I wiped off the feathers as best as I could. I brought out the rabbit and ate some of it. I broke a few small pieces off for the eagle. I took it as a good sign that she ate them so readily. I found a place among the rocks that provided some defense. The sun crept below the horizon. The last rays of light streaked across the sky and seemed to dance across the Gods’ Ring. I sat down and pulled the eagle in close to me. She didn’t resist, but stayed close as if I were her mother. I wondered what happened to the other eagles. I couldn’t believe they were all dead and I didn’t think they had just left. They had to be nearby, waiting for something. The soft feathers warmed my cheeks. I had never felt more like an eagle than when those soft wings touched my cheeks. What would it be like to fly high above the grass? To be able to spot my prey from so far away? Diving in a fast streak, sure of the power of my wings, my claws and beak? The eagle was chief of the skies. Nothing could touch her there. I didn’t realize I had closed my eyes, but I knew I was dreaming, for my father had died years ago. White Eagle held me in his lap. I didn’t protest even though once I received a name, I would be a woman, not a little girl. I’d always allow my father to hold me in my dreams. “The eagles are not gone, my soft little bird,” White Eagle said in the language of the west. My dark fingers rested on the light skin of his arm, his flesh warm beneath my touch. The familiar rush of love waved through my chest and spread through my limbs. I ignored the hollow ache that told me my father was gone. “Don’t leave,” I said in western. I knew that despite my strongest desires, once I opened my eyes my father would be gone. He smiled at me as he always smiled when I spoke the western language. I nodded, but wasn’t sure I could keep that promise. I teased my brothers and they teased me. I knew it was a sensitive subject, but I didn’t always think before I spoke. I’d try though. I didn’t want to hurt my brother, at least not at the moment. I felt myself floating up, drifting away from my father. The panic and pain gripped my heart as I opened my eyes. Mother Moon was high above. A light cloud drifted in front of her. Baby Moon sat just behind his mother. His green light drowned out by Mother’s orange. Hot tears sprang to my eyes, a painful lump formed in the back of my throat. The young eagle made a high, quiet sound, pinched my bottom lip gently with her beak and rubbed her feathers against my cheek. The touch of those soft feathers calmed me down. There was nothing grander to me at that moment than the power those wings held. The bird stiffened in my arms. Her feathers ruffled. She gave a loud, high scream. I saw it then – the fox. Its eyes reflected strangely in the moonlight, the arrow still stuck in its hind quarters. It growled low when I reached for my bow. Another growl came from my left and my heart jumped to my throat. There were two foxes. The second one bravely took a step forward, but the first held back. The eagle tried to fly away, but with her injured wing, she landed only a few feet away from me. Both foxes turned to her with hungry eyes. I shot an arrow at the second fox, but it danced backwards and the arrow stuck in the ground just where it had been. It rushed the eagle before I had time to ready another arrow. The eagle continued her high pitch screams as she tried to fly away. I watched in horror, wishing my arms and fingers would move faster, willing the arrow to be ready. An answering scream echoed high above in the night sky. The first fox and I both looked up, but the second fox was too engrossed in the young eagle to see the large eagle streaking towards it. The eagle’s talons racked the fox’s eyes. Its screech was almost as high and loud as an eagle. It tossed its head back and forth as the eagle flew into the sky, circling above and preparing for another dive. A third eagle joined the second. They dove together, driving the second fox back into the grass. A fourth and then fifth eagle cried out in the night above. More joined them, but how many more I couldn’t say. I was filled with a burning rapture at the marvel of it all. Truly the eagle was the greatest of the gods’ creatures. They dove and slashed and the first fox was driven back into the grass as the second had been. I doubted they would be back, injured as they both were. Were they the reason the eagles had left in the first place? The eagles landed around the injured one, circling her protectively. They turned to me and ruffled their brown-gold feathers. It was enough, I knew. My trial was over. It was time to go home. I headed out right then not waiting for daylight. By the time the tents stretched into view it was late afternoon. I hadn’t stopped to rest or eat. I wanted to be home. I wanted a name. I wanted to be acknowledged as a woman in my tribe. The sentries let me enter. The only greeting I received from them was a solemn nod. Although, I thought Silver Fox’s lips twitched up as though trying to fight a smile. The next person I saw was my nameless brother. He sat on the ground with his knees pulled up to his chin. I knew he waited for me. Had he been there every day, waiting? He looked up and his dark brown eyes met my green. He smiled and slowly stood. “I knew it wouldn’t take you long,” he said. I smiled and rushed over to him giving him a tight hug. It took only a few moments for the word to spread. Before I knew it, my mother and Lightning were there, making our hug into a family one. There was a crowd around us and the Chapa was there minus one, the Tepur. I hoped that meant he was preparing the fire for the final name trial ceremony, the one where I would finally be given a name and accepted as a woman of the tribe. The men and women around me cried high and shrill, the call of the eagle. Tenderfoot took my hand and squeezed it. We followed the chief to the great fire in the middle of the camp. The Tepur was there waiting. He smiled and the wrinkles in his face increased. He sat by the fire and patted the dirt beside him. I sat next to him. There was a shuffling as the tribe settled in around us and then a hush. The Tepur reached into the pouch around his neck and threw a fine pink dust over the fire. Sparks lit up the fire like stars in the sky. “Tell us,” the Tepur said. His whole focus now on the fire. He saw things there the rest of us couldn’t. I told him everything; the events, my thoughts, my feelings, my dreams. I didn’t lie. I didn’t embellish. The Tepur would have known through the fire if I had. We had all heard the past stories of children who brought disgrace to their families that way. I could smell cooking venison and corn being prepared for the feast after the ceremony. It reminded me that I hadn’t eaten all day. I hoped my stomach wouldn’t embarrass me by growling in the middle of my tale. The Tepur occasionally nodded as he stared at the sparks in the fire. The fire died down just as my story did. When I finished, there were a few whispers among the tribe. “She didn’t kill it,” Silver Fox replied. Whatever my name was going to be, I didn’t want it to be associated with the foxes. The tribe quieted so that only the crackle of fires could be heard. My heart beat faster and faster. This was it. Eagle cries drowned out all other noise as the tribe welcomed me. “Softwing,” Chief Roaring Lion said. He handed me my first eagle feather. “Softwing,” my mother said. She braided my hair for the first time symbolizing my status in the tribe. My brothers both called me by name and hugged me. After all that I had been through, there might have been a grander name than Softwing, but that name vibrated through my being. Soft like an eagle’s feathers, but strong and powerful as an eagle’s wings. That was me, the woman, Softwing. Awesome…what more can I say! Very well done. I would like to read more from Chandelle. Beautiful! Captivating! I would personally love to read more from this author. journey with Softwing who was so empowered at the end. To accept and recognize the truth about her name is so powerful. depicting her character. Charming story, written well. I wanted the story to go on, to tell us more of the family and tribe. Easy to read and a wonderful story line. I can’t wait to read more stories from Chandelle. Exciting, kept me on the edge of my seat. Great read! I am really glad that this was shared. It was a softly moving piece, that showed a lot of care involved in its telling. I would like to see Chandelle’s next piece. Great story! I could picture it all as it happened. Beautifully written! !